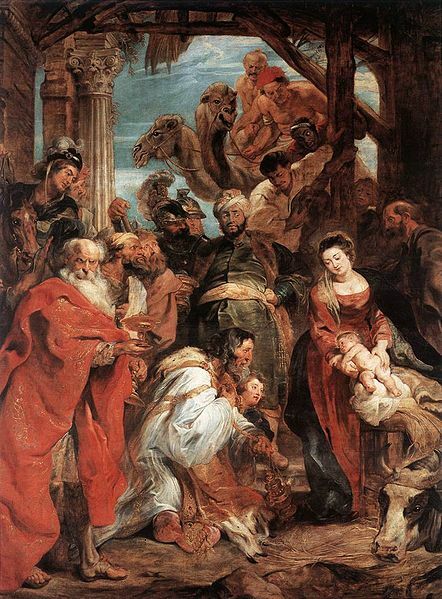 Rubens’ Adoration: Today is the day of Epiphany–the revelation of Emmanuel (God With Us) in the church tradition. The year is 1960 and it’s a cold and very cold December night in my little Texas hometown. I’m ten-years-old, turning eleven soon. Like a lot of kids in town I’m popping firecrackers and launching bottle rockets in the street in front of my yard. Christmas is fast approaching. There’s no such thing as “light pollution” in my town. It’s 1960, remember, and you don’t have to escape to some remote place far from the maddening crowds and urban sprawl to marvel at the cosmos. The night is dark but the Milky Way and the scatterings of stars above are a marvel. As I’ve done on many cloudless nights in these growing-up years, I look up and scan the skies and quietly stand in awe of it all. Suddenly, I’m gripped by a feeling of utter love, peace and splendor–a sensation so surreal and precious that I’ve never felt anything like it before. Nor have I ever felt and experienced anything remotely like that sensation in the many years since that night in my boyhood. Call it a miracle, an epiphany, a revelation, a religious experience–whatever it may have been, it put the holy whammy on me. To my way of thinking, it can only be described as a mystical experience–a sensation of total or near-total union with God. Though it’s something I’ve rarely told anyone about, if only because it defies descriptive words, I’ve hoped all of my life since to recapture that sensation just once more, knowing that you can’t recapture an act of God. I prefer to describe my childhood experience as a sensation because I didn’t “feel” it in the usual sense of a mere feeling of awe. Like everybody else, I’ve had my share of feelings of breathtaking wonder and awe one feels in, say, standing on the lip of the Grand Canyon, or snorkeling in the beautiful Blue Barrier Reef (the “Blue Hole,” as it’s commonly known) off the shores of Belize, where I’m blessed now to live. But even in the biggest, most bustling city, anyone can become so enraptured by the sight of, say, a big, blue moon rising as to feel like the tiniest and most insignificant atom in God’s magnificent Creation. A city dweller can be as filled with an intense sense of wonder and awe as a any sight-seer at the Grand Canyon or a kid under the stars in a little Texas town. Many are the wonders that can grab us and touch our spirits at levels as deep within us as the Grand Canyon or the ocean blue. So am I some kind of special VIP for having experienced a close encounter of such a grace-filled kind? Is it arrogant of me even to believe that God took hold of me, at the tender age of eleven, and shed God’s grace on me in such a powerful way? Or might I have been born somehow predisposed to high spirituality–born with a spiritual sixth sense of some kind? After all, some people seem to be born with a strong sense of spirituality and others seem not to have so much as a smudge. The answer to the first question above is a resounding no, I’m no more special than anyone else in God’s eyes. As for the other questions, I’ve mulled on them over the years. But I always come back to the certainty that my mystical experience under the stars so many moons ago was so very real to me as to defy reason–and reason is something I value very much. I’ve never been one to believe that you have to check your brain in at the church door, as they say, to be a Christian. And yet my very real mystical experience–for lack of a better description–defied reason and marked my life and my life’s entire journey in a profound way. While I value reason and believe strongly in it, I also believe in a God who has the power and grace to shatter any and all idols, reason included. On this day of Epiphany, just know that God is out there and in you too–and may God shed His grace on thee in ways powerful and gripping and in those powerfully quiet little “aha!” moments too. * In his great series of lectures and book The Varieties of Religious Experiences, William James found that one mark of a mystical experience is its ineffability.